But another view, articulated by a much smaller number of her close friends and high-level advisers, holds that Hillary bears the blame for her defeat. This case rests on the theory that Hillary’s actions before the campaign—setting up the private server, putting her name on the Clinton Foundation, and giving speeches to Wall Street banks in a time of rising populism—hamstrung her own chances so badly that she couldn’t recover. She was unable to prove to many voters that she was running for the presidency because she had a vision for the country rather than visions of power. And she couldn’t cast herself as anything but a lifelong insider when so much of the country had lost faith in its institutions and yearned for a fresh approach to governance. All of it fed a narrative of dynastic privilege that was woefully out of touch with the sentiment of the American electorate. It is typical of Clinton’s campaign in public life to show outrageously poor judgement, and then to blame others for her mistakes. Of course the second view in the above excerpt is the accurate one, even if it barely touches on the reasons Clinton’s campaign was doomed due to having a terrible candidate who ran a terrible campaign. 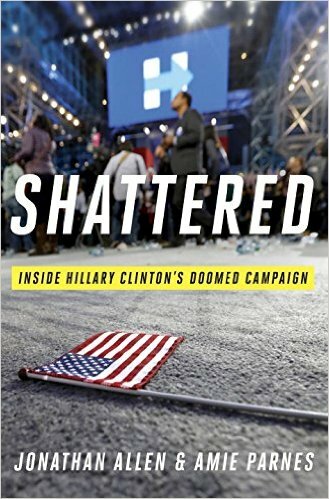 I have previously posted excerpts from Shattered here, here, and here, and have discussed why Clinton lost in multiple additional posts. Also see the excerpt I have posted from Insane Clown President: Dispatches from the 2016 Circus by Matt Taibbi on Hillary Clinton, which provides further insight into why Hillary Clinton should not have run for president in 2016 in light of the manner in which she used her political influence in an unethical manner to make money. Donald Trump’s first 100 days have been a failure, but we must also keep in mind that he is in office because the Democrats offered an alternative whose dishonesty, corruption, and poor judgement negated Trump’s negatives during the campaign, allowing Trump to win. Posted in Donald Trump, Hillary Clinton, Politics. Tags: Donald Trump, Hillary Clinton, James Comey, Russia, Shattered. RSS feed for comments on this post.. TrackBack URL. There is an Old Saying that applies here. Pride goeth before a Fall. This was certainly true for Hillary. She was convinced it was God's Will that she be the first female President of the United States. He smugness and her arrogance did here in. I am willing to bet she did not learn a thing from this reversal of fortune. Considering that she made many of the same mistakes that she made in 2008, it is very likely that she did not learn a thing. This is also seen in where she places the blame for her defeat.